Blobby objects, otherwise known as soft objects or iso-surfaces, are part of the RenderMan Specification. They are also refered to as RiBlobby because of the name of the function in the 'C' language binding of the RenderMan interface. Within Pixar's RenderMan for Maya, there is also a Mel proc called RiBlobby. 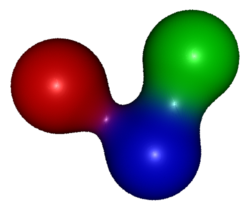 Blobby, or smooth blending effects can also be obtained with shaders. The tutorial "RSL: Blobby Effects" demonstrates how such effects can be also be obtained with a shader. The way that blobbies are specified in a rib file can become very complex. 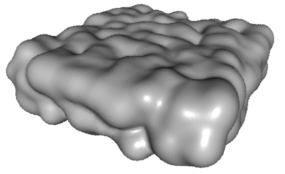 Using variations of the Blobby rib statement it is possible, for example, to "partition" the ellipsoids that make up a blobby surface into groups that merge with each other but do not merge with other groups. The code presented here considers a blobby to be made of a single homogeneous group whose ellipsoid elements "blob" together. Before looking at the implementation of a help app that generates a complex cluster of blobbies, the reader should experiment with the simple blobby given in the rib file of listing 1. Listing 2 and 3 implement a blobby helper app in Python and Tcl. A rib that references the helpers is shown in listing 4. 1000 ellipsoids in a volume 2 x 1 x 2 units. The parameters in the rib file were "1000 0.5 4.0 1.0 4.0"
set mat "$size 0 0 0  0 $size 0 0  0 0 $size 0  "
append out "Blobby $num \n"
append out "$add_ID $blob_count "
append out "\[ \"\" \]\n"